for a third straight major tournament title. Without even planning it, we have been, on two occasions, in the right place at the right time with regard to soccer championships in Europe. As even most Americans now know, soccer is colossal in Europe. It is not just a sport, but a lifestyle, a matter of national identity and fierce loyalty. Thus to witness a European country's celebration of an international soccer championship can be a cultural event as unique as Oktoberfest, Carnival, or a royal wedding. Or it can be just mass chaos and craziness. One day visiting Amsterdam in July 2010, we began to wonder why the streets and canals seemed to be closing down and residents were suspiciously appearing in droves dressed in bright orange. We were surprised to find ourselves in the middle of the wild celebrations to greet Holland's returning World Cup soccer team from their second place victory in South Africa in the 2010 FIFA World Cup. 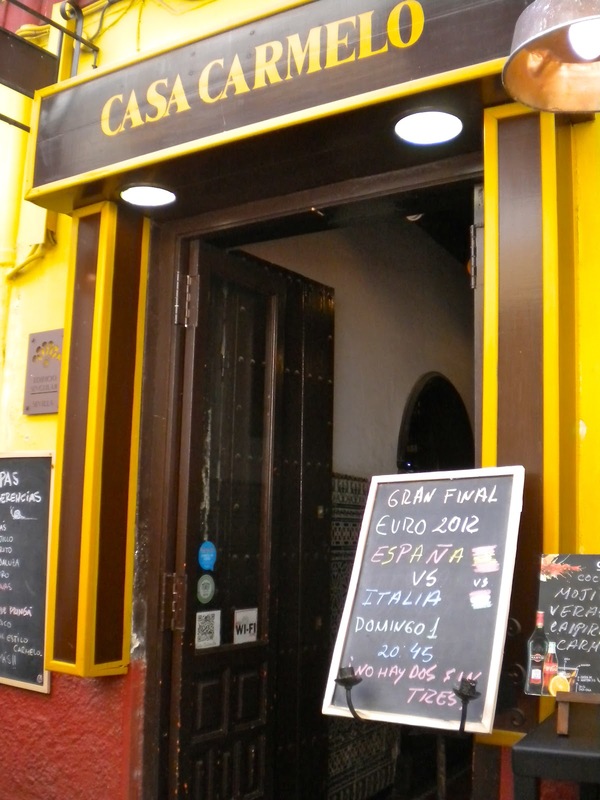 So we were amused by the coincidence, especially since we don't follow international soccer, to find ourselves in Spain this summer on the day of the final match of the European soccer championships: Italy against defending champion Spain. Souvenir soccer jerseys were for sale on every corner in Seville, but my 13 year old son was disappointed to find the going price well over 50€ and not worth almost his entire souvenir budget. He did make sure to get a flag though, to show his support that night during the game. By late afternoon little television sets were being wheeled out of every restaurant and tapas bar to the patio where large groups were expected to gather. Not to be stuck without seating for this major event, we donned any red outerwear we could find in our luggage (my daughter had no luck with this) and headed out early for our favorite little tapas bar just steps away from the front door of our apartment in the Barrio de Santa Cruz. We had already befriended a cute young waiter at tiny little Casa Carmelo earlier that week and he eagerly greeted us this night to paint the Spanish colors on my son's face and daughter's arm. Hubby and I ordered our daily ration of sangria and a variety of tapas: patatas bravas, pescaito frito, calamares, and pollo al ajillo. Yummmmmm. The game was very exciting. Each time there was a goal the crowd roared and the cooks from several surrounding restaurants would rush out of their kitchens balancing white chef's hats on their heads to watch the replay. 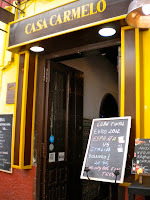 Particularly entertaining for our group of spectators was the large family of Italians seated at the bar who unfortunately for them chose this night to be in Spain, but I think they handled the jeering and in-your-face fist pumps with a fine show of sportsmanship. The growing crowds on Avenida de la Constitucíon. After Spain's 4-0 victory, my daughter and I were bushed and went to bed, but my husband and son decided to brave the crowds and craziness on the streets of Seville. My husband is surely glad I didn't go because in retrospect he would've had to fight off my panic with a stick when our son was heedlessly separated from him on the grand Avenida de la Constitucíon. It is a testament to how often we had already navigated the narrow twisting alleys of the barrio before that night, that my son managed to find his way back to the apartment by himself. I don't know who looked more shocked when he knocked on the door - him or me. Climbing into the fountain at Puerte de Jerez.